Summary: My name is Danielle. I'm eighteen. I've been stealing things for as long as I can remember. 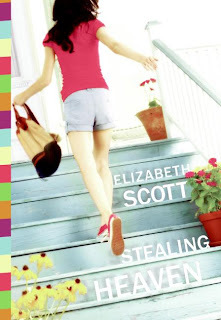 My Thoughts: I love Elizabeth Scott! Lately I have been devouring her books! I love love love them. And getting to love them makes me more excited for The Unwritten Rule! I really liked Dani and I liked the relationship she forms with Greg. He is soooo dreamy! The dialogue of this book is just so awesome. I wish I could describe how much I really did enjoy this book but I'm still left speechless. I liked the relationship between her and her mother but didn't like the way her mom depended on her so much. I was thinking to myself, whose the mom and whose the daughter again? Her mom was somewhat pushy. I know that was the point, that that is the life Dani has always known and she doesn't believe she has a choice or a chance to lead a normal life but she realizes down the line that things can be different for her. I won't say too much else, don't want to give away the whole story. I loved the cop aspect of the book. Its irnoic and thats what would happen, the way things work out! HA! But I recommend this book, yes its got romance, but it just has more than that, it has lessons, real life thoughts, its just reality. Anything can happen to you. Overall: Loved It! Wonderful in my opinion! Cover: I like it, and the way it looks like she is running away from something. Totally cute! I read this also. I loved it and I seemed the breeze right through. I love books like that. Great Review. Sounds like a fun, easy read. I need to put this author on my list.